“Ushijima” Shrine is situated near the Skytree. It is an old shrine built in the Heian Period, but it has other attractions such as “Nade Ushi” (Cuddling an ox), “Miwa Torii” (Three shrine gates” and beautiful carvings in the shrine, etc. 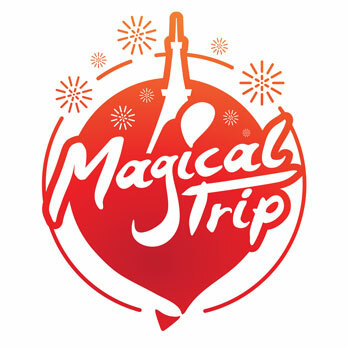 We highly recommend you to visit this shrine. 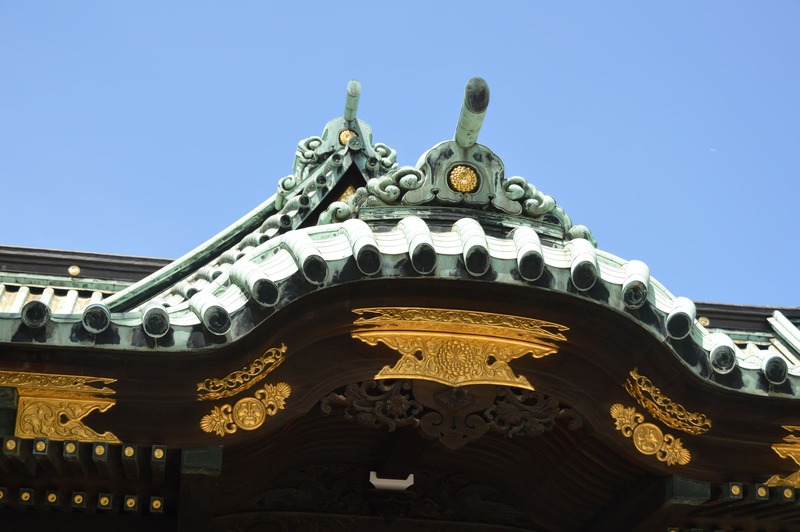 According to the shrine’s record, in around 860 “Jikaku Daishi” (a high priest named Jikaku) by divine revelation enshrined “Susano-no-Mikoto” (one of gods in the Japanese myth) as a local guardian god. 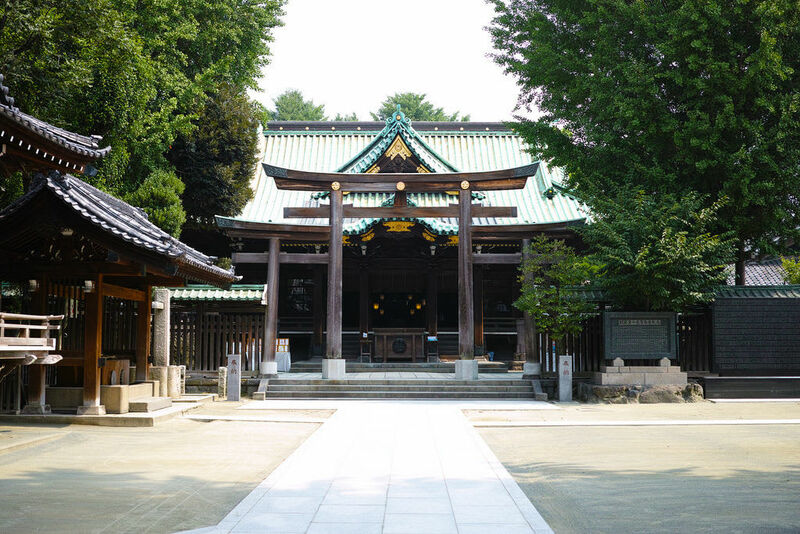 Later “Amano Hohino Mikoto” (one of gods in the Japanese myth) and Prince “Sadatoki” who was the 7th prince of Emperor “Seiwa” who passed away here, were also enshrined. In the Edo Period the shrine was worshipped as a guardian of “Kimon” (an unlucky direction) and “Iemitsu Tokugawa”, the 3rd shogun donated a land property at “Honjo Ishihara Shinmachi” (a domain in Tokyo) which was later designated “Otabisho” (a temporary shrine during festivals). 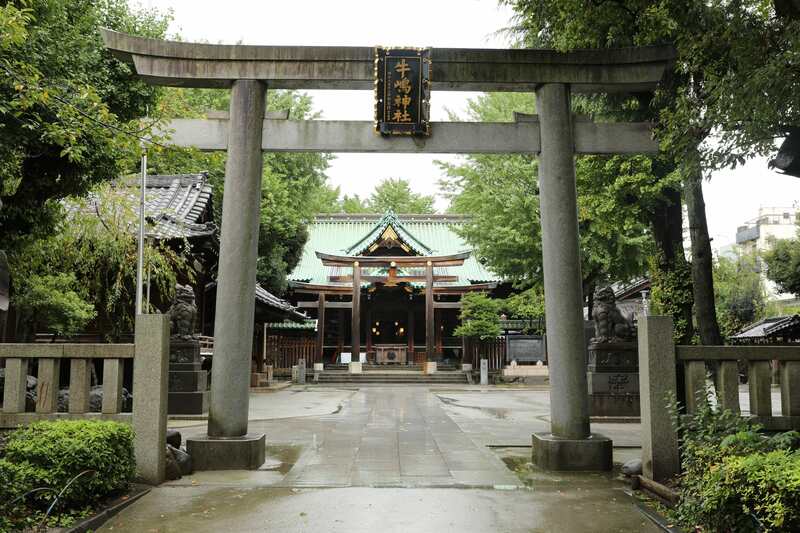 “Ushijima Shrine” was worshipped as “Honjo Sochinju” (a main shrine of tutelary deity of land) and designated as “Gosha” (a city shrine) in the Meiji Period. 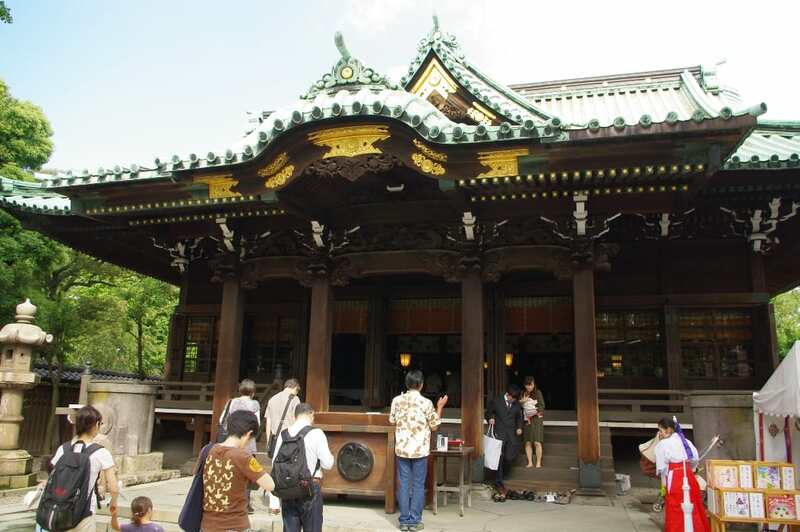 It is classified as high ranking shrine and has magnificent buildings. It is an old shrine built all in cypress with many artistic carvings. Also, pay attention to the characteristic of this shrine that ox gods are dedicated on both side of the main shrine building. 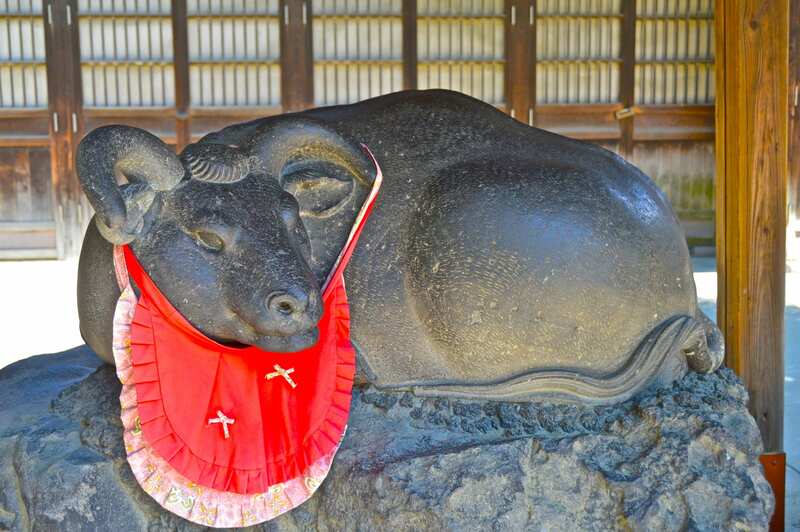 “Nade Ushi” (cuddling an ox) has been known since the Edo Period. The custom goes: First cuddle a sick part of your body then cuddle the same part of the ox statue. It is believed that the sick part will heal. The cuddling works for mental problems, too. The current statue was dedicated in around 1815, before which it used to be made by a natural stone. “Miwa Torii” (Three shrine gates) is one of the styles of Torii (a shrine gate). It is also called “Mitsu Torii”. A small torii is attached to both sides of the main torii. We don’t know where or how it derived but it is rare in Japan. It is believed that Minamoto-no-Yoritomo built the shrine in 1181. The shrine is built by wood with beautiful and meticulous carvings. It is one of the biggest shrines in Tokyo. Let’s appreciate its size. 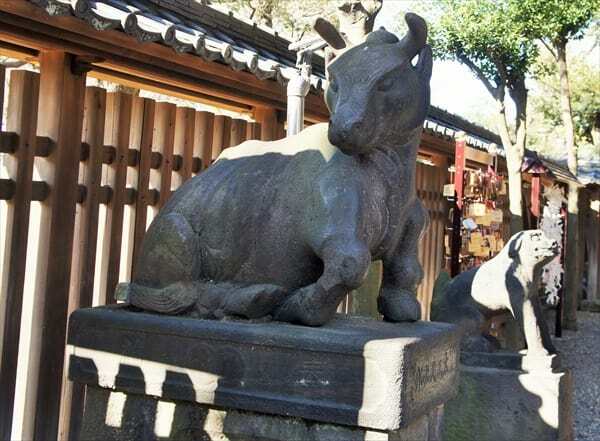 In most shrines, “Komainu” (a guardian dog) sits with scary face because it protects shrines from the evil. In “Ushijima” Shrine however, “Komaushi” (a guardian ox) uniquely sits there to protect the shrine. ・Hours: (April-September) 5:00a.m. – 6:00p.m.